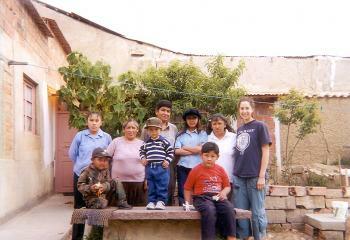 Three students from Guilford College traveled to Bolivia in May-July of 2003. They assisted with English classes in the Quaker schools and taught evening classes for adults, including Bolivian English teachers. It was a great success and was followed that fall by Haverford graduate (and then BQEF board member) Sarah Kaufman (shown with her host family in the photo) volunteering in Bolivia for four months. In addition to teaching English during her stay, Sarah also helped write, illustrate, and/or revise English texts for grades one through five. Sarah observed of her stay there: "BQEF can make a difference, and already has. Of course, the financial support is much needed, but the energy, initiative, motivation, and hope that comes with BQEF are just as important." Click image to view an enlargement. "I worked closely with two Bolivian Quaker English teachers during my four months in La Paz. We co-taught grades 1-12. These two women amazed me with their dedication, in spite of draining schedules and extremely inadequate resources and support. I admire their strength and persistence in teaching and pursuing their own education. Emma and Cecilia are part of the internal spark that is vital to making BQEF successful." "Since returning from La Paz, I think most about the people who became my friends and family while I was there. My host family really was home to me. It was wonderful to become part of this Bolivian Quaker family and to get to know all 3 generations of them." Guilford volunteer Natosha Knight wrote: "We had time to really help the professors improve, and that can be passed on to the kids. I feel we may have helped in a long-term sense as well as in the short-term." Recent volunteers have worked at the Student Residence in Sorata helping with homework and computer skills, teaching basic English lessons, sharing kitchen work, joining in energetic soccer games and helping in the organic vegetable garden. If you, or someone you know would like to share in this life-enriching experience of giving and receiving, please contact us at office (at) bqef (dot) org. If you are interested in volunteering, but are unable to travel to Bolivia, BQEF also depends on a large group of dedicated volunteers who translate letters to and from students, keep the website and Factbook page up to date, product materials for Quaker Meetings to use, present information about BQEF at meetings, and organize visits from Bolivians.